Felicity Anderson found herself loving her husband but in love with a man she'd met on the internet. For months Gabe and Felicity communicated, getting to know the persona each portrayed online. The seed began as mutual respect and quickly grew into adoration and all out love. Felicity resisted, clinging to the vows she'd made to her husband, refusing to move from his side ... until life gave her the opportunity. Would she find what she was looking for in the arms of a man she knew only in a virtual reality? Could he unleash the passion within her she'd yearned for, lacked in her marriage, or would the memory of her husband remain between them? 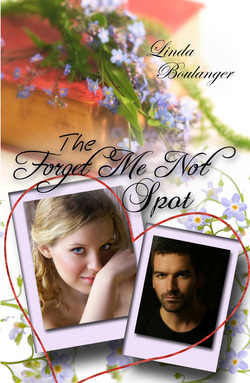 Which man would command that spot withing her heart - the forget me not spot? “I don’t give a damn, Lonnie. You either make it happen or I’ll see to it that your last paycheck is waiting for you Monday morning.” His jaw worked in irritation against the tight set of his full lips. Dark eyes stared ahead without seeing. Gabriel Saunders was angry. He’d left a junior partner in charge of what should have been an easy negotiation and the imbecile had screwed it up! He’d be damned if he was going to give up his long weekend, the first he’d taken in way too many years, to sweep up someone else’s mess. Gabe’s nature was to continue his rant, riding the kid hard for his ignorance … but something inside stopped him. He’d never been soft; never much cared what others thought or how his actions affected them. But somewhere, deep down, he felt for the twenty-eight year old newbie, knew the kid was sweating it, panicked about his future. He knew because he’d been there once. Damn! Was his heart growing soft? He allowed himself an uncharacteristic moment, thinking back to his early years. He hadn’t stayed at the bottom for long. Gabriel Saunders was a fighter, a winner. He’d quickly learned to be as ruthless as his partners, more cunning and undercutting than his opponents. He’d risen to the top as a corporate negotiator – a middle man, so to speak – in corporate takeovers, mergers, and acquisitions. He had a reputation as a nasty fighter and it had served him well. When the firm appointed Gabriel Saunders to a case, whoever had hired them knew he’d stop at nothing to succeed on their behalf. He always got what he wanted and this time would be no different. Paying little attention to Lonnie’s response, he muttered some sort of appropriate salutation so he could set about grabbing the rest of the items on his grocery list. If he hadn’t been low on toilet paper, he’d have skipped the damn store all together – just like he had the three nights before this one. He’d never liked shopping. It was even more of a chore since Nancy had left. Nancy. He couldn’t even think the name without a snarl curling his upper lip. He was a winner all right – except in the game of love. Somehow his heart had gotten in the way and became the target of a ruthless takeover. He snorted. He’d thought he had the perfect merger in Nancy Vining. She was every bit as business-minded as he was. It had seemed so right. Right up until the day she’d told him she was leaving. He’d stared at her, bewildered, having had absolutely no clue a split was brewing. “Maybe you should have paid a little more attention to your partnership at home, Gabe.” She’d hurled the words at him, her heels clattering on the hardwood as she’d brought several suitcases from the bedroom. When had she done that? Had he been so absorbed in the files he was going over he hadn’t even noticed her packing? Brows furrowed, he’d stared at her without speaking. None of his highly honed negotiation skills had prepared him for this. “And get your glass off the table top. I don’t want a water ring on it as a nasty reminder when I take it to my new place.” She’s smiled. “My lawyer will be in touch.” And, with that, she’d walked out of the house and out of his life – on a daily basis, anyway. Good riddance! Only it still hurt. He felt that tiny pinch to his heart that always came when he thought of her leaving. How could someone you love – someone who said I love you – suddenly decide they didn’t want to be with you anymore? She’d even allowed him to make love to her just the night before! He pushed the thought away. It didn’t matter how. She had left and now he was on his own, doing his own shopping, and working the hours he wanted on whatever he wanted. He felt a spark of excitement as he finished up and headed home, to his home. He’d purchased it just four months earlier and busied himself with much needed repairs both inside and out. A fixer upper his friend Crystal had called it as she’d showed it to him. It hadn’t been one she’d wanted him to see, evidenced by the wrinkle of her upturned nose as they’d walked through. Another friend had told him about it, thinking perhaps the added work it would require was exactly what Gabe needed. Not that Gabe was ever idle, but it would require a different kind of busy. He’d thought about it, then quickly called his other friend acting as realtor. Crystal had picked him up one afternoon, they’d taken a look, and two days later he was signing the contract – no earnest money required. He’d walked out of Crystal’s office feeling pretty good about his chances of getting the house as well as about the chunk of change he’d saved by buying a fixer upper. Not that he was exactly hurting for money. Still, he always liked a deal and the negotiation had been rather fun. He got the house – that part of the daydream had come true. The savings … he watched the coin pile dwindle with each repair. Still. He looked around and smiled before settling onto the sofa, his laptop right in his lap, where it belonged, and his feet propped up on the new coffee table. A bowl of chips sat on one side, while a large glass of tea, not too far from his feet, kept one of his brand new coasters company. He reached for the glass, took a drink and put the glass back directly on the table. If it left water rings, they’d be all his too. He had no one to worry about pleasing but himself. It felt good. His fixer-upper had a yard to match that was in dire need of landscaping help. He could have hired it done, probably should have, but he’d found he rather enjoyed the challenge and his yard was where he’d planned to turn his attention that Thursday evening in late March. He’d downed a sandwich and taken his chips and tea to the living room, pleased by the feel of his new hardwood floors on his bare feet as he’d moved in to relax on the sofa and surf the internet for tips and tricks for low maintenance landscaping. After a good forty minutes of yawn-evoking site hopping he’d stumbled across one that caught his attention. ForgetMeNotGardenSpot.blogspot.com. It appeared to be ran by the owners of a nursery several hundred miles north but still in his own growing zone. Cornell, Oklahoma. Gabe had never heard of it, but he was immediately pulled in by the posts which were sprinkled with helpful hints, witty humor, and colorful pictures and design ideas. He looked through several of their posts, jotting down notes and drawing up his own tentative plan for his currently barren yard. He closed the lid of his laptop some three hours later, confident, pleased with his vision. Armed with his sketch and newfound knowledge, he’d use the first day of his three day weekend to tackle his yard. He felt rather he-manish as he carried his dishes back to the kitchen, his thoughts on working the land. He’d begin bright and early the next morning … right after hanging the new curtains. He was tired of sheets covering the windows. Felicity Anderson absently twirled blond curls around a finger as she proofed her blog post. Blue eyes skimmed the page for the third time, checking for missed errors and proper placement. Satisfied, she hit the post button and turned her attention to her husband. His head was bowed over a stack of papers as he looked over their finances. He’d already placed the spring order and, as happened every year, they’d have to juggle to keep afloat for a bit as the cash had gone out before the goods came in and the customers started buying. Felicity was glad to have her little gardening blog to occupy her during the nerve-wracking time. It had been a busy night for her. Not only had she added the new post, but her followers had left many comments on her Peonies For Your Thoughts post. They liked to share. She’d learned early on to call for them to do so and, in return, had developed quite a following. It didn’t hurt that she offered practical help tips and colorful drawings. That was her specialty – the drawings. In fact, she’d spent the majority of her day redesigning the overgrown garden in Mr. Parker’s new home, finalizing the Compton’s landscaping project design, and helping a group of kids enrolled in the community’s technology institute work out the layout for an addition to the Welcome Garden that greeted visitors as they entered the main part of Cornell. A handful of customers had also come in seeking her advice on the layouts they’d designed themselves, thanks to her helpful little blog. Doug didn’t understand why she’d want to give away her talent. Felicity never saw it that way. She knew a good chunk of those who sought her advice would or had become loyal customers of their nursery. Even those who followed online often contributed to their bottom line. She received donations here and there and many of them subscribed to her quarterly newsletter that could be downloaded as a pdf for a dollar a pop. It was well worth it, she was often told via comments and emails. Her newsletters overflowed with gardening goodness. She called it The Forget Me Not Spot ~ Thoughts From A Gardener’s Heart. And speaking of thoughts… she only had a couple of weeks to finish up the next installment. She needed to start the summer edition as well. July 1 due date – that had her working on it all during peak season. Her shoulders slumped at the thought of their busy time. She always felt so ragged by the time things slowed down in early August … only to pick up again late September as Fall rolled in. Winter found her needed less onsite at the nursery. She lived for those times; that five months where she could hunker in and devote herself to learning more about the plants and the earth and work on new ways of combining it all into beautiful snapshots from the simply functional to absolutely breathtaking. And she shared it all with her followers. Her always soft voice caused Doug to turn from the numbers before him. He watched his wife rise. She stretched her arms above her head, straightening her body after too long sitting at her desk. His eyes traveled down her slender frame. She’d always reminded him of a delicate flower, though she was as hardy as a weed. No matter what life handed her, she seemed to pop back up and continue to grow. “Will you be much longer?” she asked, stepping closer. He pushed away from his desk and pulled her to sit on his lap. She giggled, even as she stiffened in his arms. Five years of marriage and she was still shy of him where intimacy was concerned. It didn’t make him want her any less. Felicity was beautiful in a simple sort of way. She had a grace and loveliness that emanated from the inside out. He’d been attracted to her the first time he’d seen her. She was twenty years old. A year later he’d made her his bride; a decision he’d never regretted. Doug breathed deeply, drinking in her scent. Not unlike his nursery, she had a light, earthy floral essence. Felicity’s chin fell to her chest and she scrunched her shoulder to ward off his attempts to kiss the tender flesh of her neck. With a nervous giggle she slipped from his lap, offering a shy smile in his direction as she headed toward their bedroom. Doug sighed, unsure if she wanted him to follow. He was never sure whether Felicity wanted him or not. She never refused his advances and yet … there were no sparks for her from what he could tell. They were both young and inexperienced when they’d married – a fact he’d wanted from his wife, though his own lack of knowledge seemed a hindrance in their relationship. Another sigh and he turned back to the books. Surely someday they’d get it right. He smiled. At least they had a lifetime together to try to make it work. Felicity lay in her bed listening for her husband’s footsteps. Disappointing silence was all she heard. She should have known he wouldn’t come. She’d given him no reason to follow her. A simple tear squeezed from her tightly closed eyes. Felicity Anderson yearned for more from her relationship. She simply had no idea how to go about getting what she wanted.